Endogenous and recombinant human soluble Neuropilin-1 (isoform 2 and 3). Due to the high sequence homology between human NPR1 and NPR1 of other species there is potential cross-reactivity with mouse, rat, pig and rhesus macaque NPR1 and NPR1 of other species. Neuropilin-1 (NRP1) only. The amino acid sequence in the respective binding regions of the antibodies show no homology with NRP2. Thus, cross-reactivity to NRP2 is not expected. The total soluble Neuropilin-1 (NRP1) immunoassay is a 4 hour, 96-well sandwich enzyme-linked immunosorbent assay (ELISA) for the quantitative determination of free and ligand-bound soluble Neuropilin-1 in human serum and plasma. The assay employs human serum-based standards to ensure the measurement of biologically reliable data. 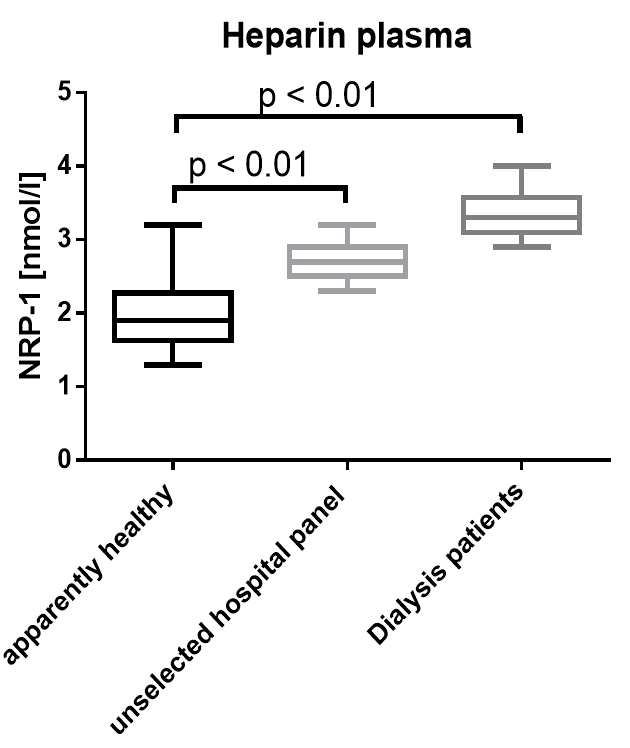 NRP1 measurements in urine, cell-culture supernatants and non-human samples did not undergo a full validation according to FDA/ICH/EMEA guidelines. However, our performance check suggests that these matrices can be measured with this ELISA. For more information please see our validation data file. 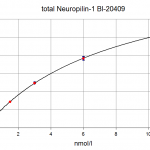 The total soluble Neuropilin-1 ELISA kit uses highly purified, epitope mapped antibodies. The detection antibody used in the total soluble Neuropilin-1 ELISA kit binds to a linear epitope close to the N-terminus in the CUB1 domain of NRP1 and the polyclonal coating antibody recognizes multiple linear epitopes distributed over the entire Neuropilin-1 molecule. The total soluble Neuropilin-1 ELISA kit is a sandwich enzyme immunoassay for the quantitative determination of Neuropilin-1 (NPR1) in human serum and plasma. In a first step, standard/control/sample require pre-treatment with an equal amount of guanidine hydrochloride (GuHCl) to remove potentially bound ligands, followed by pre-dilution with assay buffer. In a next step, pre-treated and diluted standard/control/sample and detection antibody (monoclonal mouse anti-human NRP1) are pipetted into the wells of the microtiter strips, which are pre-coated with polyclonal sheep anti-human NRP1 antibody. NPR1 present in standard/control/sample binds to the pre-coated antibody in the well and forms a sandwich with the detection antibody. In the washing step, all non-specific unbound material is removed. Subsequently, the conjugate (streptavidin-HRP) is pipetted into the wells and reacts with the detection antibody. After another washing step, the substrate (TMB, tetramethylbenzidine) is pipetted into the wells. The enzyme-catalyzed color change of the substrate is directly proportional to the amount of NPR1 present in the sample. This color change is detectable with a standard microtiter plate reader. A dose response curve of the absorbance (optical density, OD at 450 nm) vs. standard concentration is generated, using the values obtained from the standard. The concentration of NPR1 in the sample is determined directly from the dose response curve. Storage instructions: All reagents of the human soluble Neuropilin-1 ELISA kit are stable at 4°C (2-8°C) until the expiry date stated on the label of each reagent. Serum, EDTA plasma, heparin plasma, citrate plasma, cell culture supernatant, urine, non-human samples are suitable for use in this assay. Do not change sample type during studies. We recommend duplicate measurements for all samples, standards and controls. The listed sample collection and storage conditions listed are intended as general guidelines. Collect venous blood samples in standardized serum separator tubes (SST) or standardized blood collection tubes using EDTA, heparin or citrate as an anticoagulant. For serum samples, allow samples to clot for 30 minutes at room temperature. Perform separation by centrifugation according to the tube manufacturer’s instructions for use. Assay the acquired samples immediately or aliquot and store at -25°C or lower. Lipemic or haemolysed samples may give erroneous results. Do not freeze-thaw samples more than five times. Note: the experiments performed to measure Neuropilin-1 in urine samples did not undergo a full validation according to /EMEA guidelines. However, our performance check suggests that urine samples can be measured with this ELISA. For more information please see our validation data tab. Note: the experiments performed to measure Neuropilin-1 cell culture supernatants did not undergo a full validation according to FDA/ICH/EMEA guidelines. However, our performance check suggests that cell culture supernatants can be measured with this ELISA. For more information please see our validation data file. Pipette 200 µl of distilled or deionized water into each standard (STDs) and control (CTRL) vial. The exact concentration is printed on the label of each vial. Leave at room temperature (18-26°C) for 15 min. Mix gently. Reconstituted STDs and CTRLs are stable at -25°C or lower until expiry date stated on the label. STDs and CTRLs are stable for five freeze-thaw cycles. Reconstitute standard 7 (STD7) in 200 µl deionized water. Leave at room temperature (18-26°C) for 15 min and mix well before making dilutions. Use polypropylene tubes. Mark tubes ccSTD6 to ccSTD1. Dispense 100 µl cell culture medium into each vial. Pipette 100 µl of STD7 into tube marked as ccSTD6. Mix thoroughly. Continue in the same fashion to obtain ccSTD4 to ccSTD2. CCM serves as the ccSTD1 (0 nmol/l soluble Neuropilin-1). Using the prepared standards, follow the protocol as indicated for serum, plasma and urine samples. Attention: Supplied STD1-STD7 and controls are only valid for serum, plasma and urine and should not be used for cell culture measurements. Bring samples to room temperature and mix samples gently to ensure the samples are homogenous. We recommend duplicate measurements for all samples. Samples for which the OD value exceeds the highest point of the standard range can be diluted with STD1 (standard 1 = human serum containing 0 nmol/l NRP1) before pre-treatment with GuHCl. Mark positions for STD/CTRL/SAMPLE (standard/control/sample) on the protocol sheet. Pipette 10 µl STD/CTRL/SAMPLE (standard/control/sample) into the respective wells. Add 10 µl GuHCl (Guanidin Hydrochloride, clear cap) into each well. Take care to add the GuHCl to the STD/CTRL/SAMPLE at the bottom of the well. Cover the plate tightly, swirl gently and incubate for 30 minutes at room temperature. Add 200 µl ASYBUF (assay buffer, red cap) into each well. Cover plate and swirl gently. Pipette 50 µl ASYBUF into each well. Transfer 50 µl pre-treated STD/CTRL/SAMPLE from pre-dilution plate into the respective wells. Swirl gently. If available, use a multichannel pipette for the transfer. The transfer should be performed immediately after the pre-dilution has concluded. Add 50 µl AB (biotinylated anti NRP-1 antibody, green cap) into each well. Swirl gently. Cover the plate tightly, swirl gently and incubate for 2 hours at room temperature (18-26°C). Aspirate and wash wells 5x with 300 µl diluted WASHBUF. After the final wash, remove the remaining WASHBUF by strongly tapping plate against a paper towel. Add 150 µl CONJ (conjugate, amber cap) into each well. Swirl gently. Cover tightly and incubate for 1 hour at room temperature 18-26°C), in the dark. Aspirate and wash wells 5x with 300 µl diluted WASHBUF. After the final wash, remove remaining WASHBUF by strongly tapping plate against a paper towel. Add 150 µl SUB (substrate, blue cap) into each well. Swirl gently. Incubate for 30 min at room temperature in the dark. Add 50 µl STOP (stop solution, white cap) into each well, swirl gently. Measure absorbance immediately at 450 nm with reference 630 nm, if available. Obtain sample concentrations from the standard curve. If required, nmol/l can be converted into pg/ml by applying a conversion factor (1 nmol/l = 0.014 ng/ml; Neuropilin-1 MW: 69.7 kDa). )). Respective dilution factors have to be considered when calculating the final concentration of the sample. The quality control protocol supplied with the kit shows the results of the final release QC for each kit at the production date. ODs obtained by customers may differ due to various influences including a normal decrease of signal intensity throughout shelf life. However, this does not affect the validity of the results provided an OD of 1.00 or higher is obtained for the standard with the highest concentration, and the measured values of the CRTLS fall within their target ranges (see labels). Neuropilin-1 (NRP1) is a single-pass transmembrane glycoprotein of 923 amino acids, composed of a large extracellular region, a short transmembrane domain and a short cytoplasmic tail (https://www.uniprot.org/uniprot/O14786). Due to alternative splicing or shedding, the extracellular region can be released into circulation as soluble Neuropilin-1. Neuropilin-1 (NRP1) is an essential cell surface receptor functioning in many key biological processes including the cardiovascular, neuronal, and immune systems (Guo and Vander Kooi, 2015; Koch, 2012). Multiple ligands bind to the extracellular region of NRP1, like class III Semaphorins which have a crucial role in axonal guidance, or members of the VEGF family of angiogenic cytokines. Ligand-binding to transmembrane NRP1, which has co-receptor function, leads to signaling via receptor proteins containing a PDZ domain. In contrast, ligand-binding to soluble Neuropilin-1 (sNRP1) has antagonistic properties by acting as a decoy (Gu et al., 2002; Guo and Vander Kooi, 2015). A variety of cells and tissues express NRP1. For instance, the transmembrane protein is expressed by neuronal cells, endothelial cells, vascular smooth muscle cells, cardiomyocytes, multiple tumor cell lines and neoplasms, osteoblasts, naïve T cells or platelets. Moreover, some studies describe the expression of soluble Neuropilin-1 in a variety of non-endothelial cells, e.g. in liver hepatocytes and kidney distal and proximal tubules, and implicate Neuropilin-1 in a multitude of physiological and pathological settings, e.g. in axon guidance, vascularization, tumor growth or regeneration and repair (Alattar et al., 2014; Bondeva and Wolf, 2015; Roy et al., 2017; Telley et al., 2016; Tse et al., 2017; Zachary, 2014). 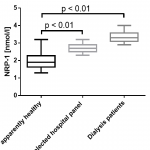 Neuropilin-1 is described to stimulate osteoblast differentiation, to act as a potential biomarker for the prediction of heart failure outcome or to play a role in renal fibrogenesis (Bondeva and Wolf, 2015; Chen et al., 2013, p. 1; Pellet-Many et al., 2008). As a co-receptor for VEGF, NRP1 is a potential target for cancer therapies (Graziani and Lacal, 2015). The Pro-Tumoral Activity of Heparan Sulfate 3-O-Sulfotransferase 3B (HS3ST3B) in Breast Cancer MDA-MB-231 Cells Is Dependent on the Expression of Neuropilin-1. Hellec, C., Diawara, M., Carpentier, M., Denys, A., Allain, F., 2018. Mol. Basel Switz. 23. Neuropilin 1 (NRP1) is a novel tumor marker in hepatocellular carcinoma. Lin, J., Zhang, Y., Wu, J., Li, L., Chen, N., Ni, P., Song, L., Liu, X., 2018. Clin. Chim. Acta Int. J. Clin. Chem. 485, 158–165. 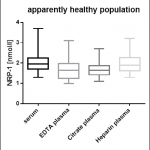 The NRP1 migraine risk variant shows evidence of association with menstrual migraine. Pollock, C.E., Sutherland, H.G., Maher, B.H., Lea, R.A., Haupt, L.M., Frith, A., Anne MacGregor, E., Griffiths, L.R., 2018. J. Headache Pain 19, 31. Neuropilin 1 ameliorates electrical remodeling at infarct border zones in rats after myocardial infarction. Wen, H.-Z., Xie, P., Zhang, F., Ma, Y., Li, Y.-L., Xu, S.-K., 2018. Auton. Neurosci. Basic Clin. 214, 19–23. Neuropilin-1 expression in adipose tissue macrophages protects against obesity and metabolic syndrome. Wilson, A.M., Shao, Z., Grenier, V., Mawambo, G., Daudelin, J.-F., Dejda, A., Pilon, F., Popovic, N., Boulet, S., Parinot, C., Oubaha, M., Labrecque, N., de Guire, V., Laplante, M., Lettre, G., Sennlaub, F., Joyal, J.-S., Meunier, M., Sapieha, P., 2018. Sci. Immunol. 3. Zhang, G., Chen, L., Khan, A.A., Li, B., Gu, B., Lin, F., Su, X., Yan, J., 2018. Int. J. Cancer 143, 635–644. Neuropilin-1 regulated by miR-320 contributes to the growth and metastasis of cholangiocarcinoma cells. Zhu, H., Jiang, X., Zhou, X., Dong, X., Xie, K., Yang, C., Jiang, H., Sun, X., Lu, J., 2018. Liver Int. Off. J. Int. Assoc. Study Liver 38, 125–135. The Expression of Neuropilin-1 in Human Placentas From Normal and Preeclamptic Pregnancies. Arad, A., Nammouz, S., Nov, Y., Ohel, G., Bejar, J., Vadasz, Z., 2017. Int. J. Gynecol. Pathol. Off. J. Int. Soc. Gynecol. Pathol. 36, 42–49. Neuropilin-1 modulates TGFβ signaling to drive glioblastoma growth and recurrence after anti-angiogenic therapy. Kwiatkowski, S.C., Guerrero, P.A., Hirota, S., Chen, Z., Morales, J.E., Aghi, M., McCarty, J.H., 2017. PloS One 12, e0185065. Multifaceted Role of Neuropilins in the Immune System: Potential Targets for Immunotherapy. Roy, S., Bag, A.K., Singh, R.K., Talmadge, J.E., Batra, S.K., Datta, K., 2017. Front. Immunol. 8, 1228. Neuropilin-1 is upregulated in the adaptive response of prostate tumors to androgen-targeted therapies and is prognostic of metastatic progression and patient mortality. Tse, B.W.C., Volpert, M., Ratther, E., Stylianou, N., Nouri, M., McGowan, K., Lehman, M.L., McPherson, S.J., Roshan-Moniri, M., Butler, M.S., Caradec, J., Gregory-Evans, C.Y., McGovern, J., Das, R., Takhar, M., Erho, N., Alshalafa, M., Davicioni, E., Schaeffer, E.M., Jenkins, R.B., Ross, A.E., Karnes, R.J., Den, R.B., Fazli, L., Gregory, P.A., Gleave, M.E., Williams, E.D., Rennie, P.S., Buttyan, R., Gunter, J.H., Selth, L.A., Russell, P.J., Nelson, C.C., Hollier, B.G., 2017. Oncogene 36, 3417–3427. Inhibition of primary breast tumor growth and metastasis using a neuropilin-1 transmembrane domain interfering peptide. Arpel, A., Gamper, C., Spenlé, C., Fernandez, A., Jacob, L., Baumlin, N., Laquerriere, P., Orend, G., Crémel, G., Bagnard, D., 2016. Oncotarget 7, 54723–54732. Neuropilin-1 is associated with clinicopathology of gastric cancer and contributes to cell proliferation and migration as multifunctional co-receptors. Li, L., Jiang, X., Zhang, Q., Dong, X., Gao, Y., He, Y., Qiao, H., Xie, F., Xie, X., Sun, X., 2016. J. Exp. Clin. Cancer Res. CR 35, 16. Novel regulatory role of neuropilin-1 in endothelial-to-mesenchymal transition and fibrosis in pancreatic ductal adenocarcinoma. Matkar, P.N., Singh, K.K., Rudenko, D., Kim, Y.J., Kuliszewski, M.A., Prud’homme, G.J., Hedley, D.W., Leong-Poi, H., 2016. Oncotarget 7, 69489–69506. Dual Function of NRP1 in Axon Guidance and Subcellular Target Recognition in Cerebellum. Telley, L., Cadilhac, C., Cioni, J.-M., Saywell, V., Jahannault-Talignani, C., Huettl, R.E., Sarrailh-Faivre, C., Dayer, A., Huber, A.B., Ango, F., 2016. Neuron 91, 1276–1291. Comprehensive study of angiogenic factors in women with endometriosis compared to women without endometriosis. Yerlikaya, G., Balendran, S., Pröstling, K., Reischer, T., Birner, P., Wenzl, R., Kuessel, L., Streubel, B., Husslein, H., 2016. Eur. J. Obstet. Gynecol. Reprod. Biol. 204, 88–98. High Expression of Neuropilin-1 Associates with Unfavorable Clinicopathological Features in Hepatocellular Carcinoma. Zhang, Y., Liu, P., Jiang, Y., Dou, X., Yan, J., Ma, C., Fan, Q., Wang, W., Su, F., Tang, H., Su, X., 2016. Pathol. Oncol. Res. POR 22, 367–375. 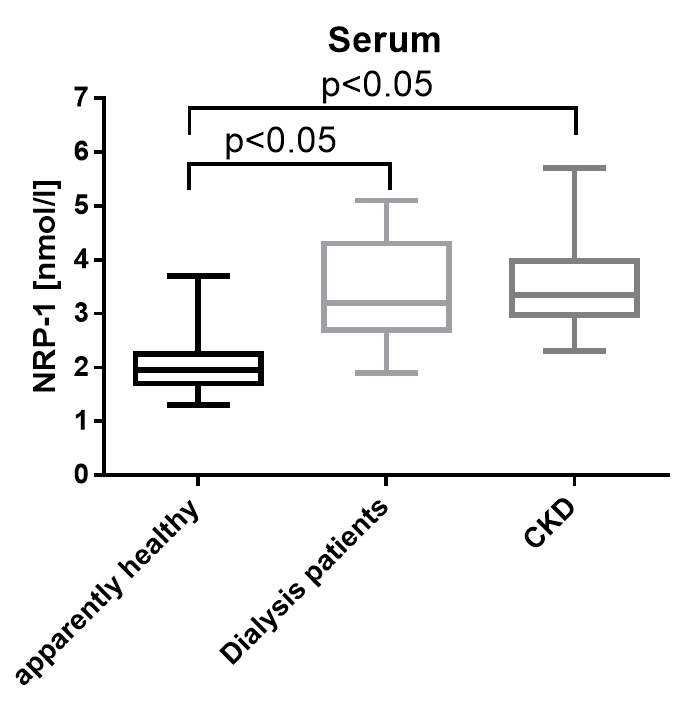 Role of Neuropilin-1 in Diabetic Nephropathy. Bondeva, T., Wolf, G., 2015. J. Clin. Med. 4, 1293–1311. Neuropilin 1 expression correlates with the Radio-resistance of human non-small-cell lung cancer cells. Dong, J.C., Gao, H., Zuo, S.Y., Zhang, H.Q., Zhao, G., Sun, S.L., Han, H.L., Jin, L.L., Shao, L.H., Wei, W., Jin, S.Z., 2015. J. Cell. Mol. Med. 19, 2286–2295. Neuropilin-1 as Therapeutic Target for Malignant Melanoma. Graziani, G., Lacal, P.M., 2015. Front. Oncol. 5. Neuropilin Functions as an Essential Cell Surface Receptor. Guo, H.-F., Vander Kooi, C.W., 2015. J. Biol. Chem. 290, 29120–29126. Effects of RNA interference-mediated NRP-1 silencing on the proliferation and apoptosis of breast cancer cells. Han, Z., Jiang, G., Zhang, Y., Xu, J., Chen, C., Zhang, L., Xu, Z., Du, X., 2015. Mol. Med. Rep. 12, 513–519. Increased expression of neuropilin 1 is associated with epithelial ovarian carcinoma. Jiang, H., Xi, Q., Wang, F., Sun, Z., Huang, Z., Qi, L., 2015. Mol. Med. Rep. 12, 2114–2120. Increased expression of neuropilin 1 in melanoma progression and its prognostic significance in patients with melanoma. Lu, J., Cheng, Y., Zhang, G., Tang, Y., Dong, Z., McElwee, K.J., Li, G., 2015. Mol. Med. Rep. 12, 2668–2676. Neuropilin 1 expression in human aortas, coronaries and the main bypass grafts. Alattar, M., Jiang, C., Luan, Z., Pan, T., Liu, L., Li, J., 2014a. Eur. J. Cardio-Thorac. Surg. Off. J. Eur. Assoc. Cardio-Thorac. Surg. 46, 967–973. Neuropilin-1 expression in squamous cell carcinoma of the oesophagus. Alattar, M., Omo, A., Elsharawy, M., Li, J., 2014b. Eur. J. Cardio-Thorac. Surg. Off. J. Eur. Assoc. Cardio-Thorac. Surg. 45, 514–520. High neuropilin 1 expression was associated with angiogenesis and poor overall survival in resected pancreatic ductal adenocarcinoma. Ben, Q., Zheng, J., Fei, J., An, W., Li, P., Li, Z., Yuan, Y., 2014. Pancreas 43, 744–749. NRP-1 expression in bladder cancer and its implications for tumor progression. Cheng, W., Fu, D., Wei, Z.-F., Xu, F., Xu, X.-F., Liu, Y.-H., Ge, J.-P., Tian, F., Han, C.-H., Zhang, Z.-Y., Zhou, L.-M., 2014. Tumour Biol. J. Int. Soc. Oncodevelopmental Biol. Med. 35, 6089–6094. Neuropilin-1 promotes epithelial-to-mesenchymal transition by stimulating nuclear factor-kappa B and is associated with poor prognosis in human oral squamous cell carcinoma. Chu, W., Song, X., Yang, X., Ma, L., Zhu, J., He, M., Wang, Z., Wu, Y., 2014. PloS One 9, e101931. Knockdown of neuropilin-1 suppresses invasion, angiogenesis, and increases the chemosensitivity to doxorubicin in osteosarcoma cells - an in vitro study. Neuropilins: role in signalling, angiogenesis and disease. Zachary, I., 2014. Chem. Immunol. Allergy 99, 37–70. Investigation of a novel biomarker, neuropilin-1, and its application for poor prognosis in acute myeloid leukemia patients. Zhao, J., Gu, L., Li, C., Ma, W., Ni, Z., 2014. Tumor Biol. 35, 6919–6924. Neuropilin-1 is overexpressed in osteosarcoma and contributes to tumor progression and poor prognosis. Zhu, H., Cai, H., Tang, M., Tang, J., 2014. Clin. Transl. Oncol. Off. Publ. Fed. Span. Oncol. Soc. Natl. Cancer Inst. Mex. 16, 732–738. Peritumoral Neuropilin-1 and VEGF receptor-2 expression increases time to recurrence in hepatocellular carcinoma patients undergoing curative hepatectomy. Zhuang, P.-Y., Wang, J.-D., Tang, Z.-H., Zhou, X.-P., Yang, Y., Quan, Z.-W., Liu, Y.-B., Shen, J., 2014. Oncotarget 5, 11121–11132. Inhibitory effect of neuropilin-1 monoclonal antibody (NRP-1 MAb) on glioma tumor in mice. Prognostic implication of neuropilin-1 upregulation in human nasopharyngeal carcinoma. Xu, Y., Li, P., Zhang, X., Wang, J., Gu, D., Wang, Y., 2013. Diagn. Pathol. 8, 155. Koch, S., 2012. Biochem. Soc. Trans. 40, 20–25. microRNA-320a inhibits tumor invasion by targeting neuropilin 1 and is associated with liver metastasis in colorectal cancer. Zhang, Y., He, X., Liu, Yulan, Ye, Y., Zhang, H., He, P., Zhang, Q., Dong, L., Liu, Yujing, Dong, J., 2012. Oncol. Rep. 27, 685–694. Neuropilins: structure, function and role in disease. Pellet-Many, C., Frankel, P., Jia, H., Zachary, I., 2008. Biochem. J. 411, 211–226. Characterization of Neuropilin-1 Structural Features That Confer Binding to Semaphorin 3A and Vascular Endothelial Growth Factor 165. Gu, C., Limberg, B.J., Whitaker, G.B., Perman, B., Leahy, D.J., Rosenbaum, J.S., Ginty, D.D., Kolodkin, A.L., 2002. J. Biol. Chem. 277, 18069–18076. 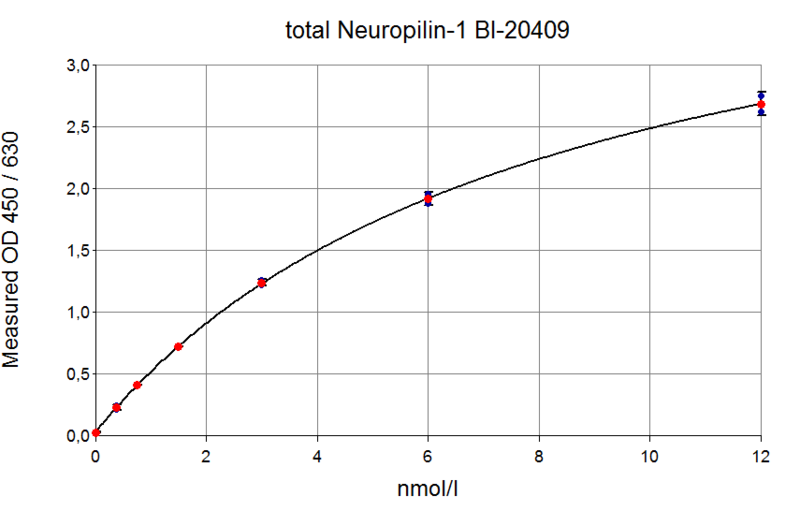 The total soluble Neuropilin-1 human immunoassay is calibrated against recombinant human soluble Neuropilin-1 protein (AA22-644 of O14786-2 (Uniprot ID)). To determine the sensitivity of the human total soluble Neuropilin-1 ELISA, experiments measuring the lower limit of detection (LOD) and the lower limit of quantification (LLOQ) were conducted. The LOD, also called the detection limit, is the lowest point at which a signal can be distinguished above the background signal, i.e. the signal that is measured in the absence of Neuropilin-1, with a confidence level of 99%. It is defined as the mean back calculated concentration of standard 1 (STD1) Neuropilin-1-free sample (three independent measurements) plus three times the standard deviation of the measurements. The LLOQ, or sensitivity of an assay, is the lowest concentration at which an analyte can be accurately quantified. The criteria for accurate quantification at the LLOQ are an analyte recovery between 75 and 125% and a coefficient of variation (CV) of less than 25%. The lowest concentration of Neuropilin-1, which meets both criteria, is reported as the LLOQ. Within-run precision (intra-assay precision) was assessed by measuring two samples of known concentration six times within one total soluble Neuropilin-1 ELISA lot by one operator. In-between-run presicion (intra-assay precision) was assessed by measuring two samples twelve times within two total soluble Neuropilin-1 ELISA kit lots on three days by three different operators. The recovery of the total soluble Neuropilin-1 ELISA was measured by adding recombinant soluble Neuropilin-1 to human samples containing a known concentration endogenous soluble Neuropilin-1. The % recovery of the spiked concentration was calculated as the percentage of measured compared over the expected value. Tests of dilution linearity and parallelism ensure that both endogenous and recombinant samples containing soluble Neuropilin-1 behave in a dose dependent manner and are not affected by matrix effects. Dilution linearity assesses the accuracy of measurements in diluted human samples spiked with known concentrations of recombinant analyte. By contrast, parallelism refers to dilution linearity in human samples and provides evidence that the endogenous analyte behaves the same way as the recombinant one. Dilution linearity and parallelism are assessed for each sample type and are considered acceptable if the results are within ± 20% of the expected concentration. Dilution linearity was assessed by serially diluting human samples spiked with 6 nmol/l recombinant human soluble Neuropilin-1 with STD1 (standard 1= human serum containing 0 nmol/l Neuropilin-1). The table below shows the mean recovery and range of serially diluted recombinant soluble Neuropilin-1 in serum and plasma. Parallelism was assessed by serially diluting samples containing endogenous Neuropilin-1 with STD1 (standard 1 = human serum containing 0 nmol/l Neuropilin-1). The total soluble Neuropilin-1 ELISA utilizes a polyclonal sheep anti-human Neuropilin-1 capture antibody that binds to multiple linear epitopes distributed over the entire Neuropilin-1 molecule (between AA81-AA630). The monoclonal mouse anti-human Neuropilin-1 detection antibody binds to a linear epitope close to the N-terminus in the CUB 1 domain of the Neuropilin-1 molecule. The specificity of the total soluble Neuropilin-1 ELISA was shown by characterizing both the capture and the detection antibodies through epitope mapping. In addition, the specificity of the ELISA was established through competition experiments, which measure the ability of the antibodies to exclusively bind Neuropilin-1. Competition experiments were carried out by pre-incubating human samples with an excess of coating antibody. The concentration measured in this mixture was then compared to a reference value, which was obtained from the same sample but without the pre-incubation step. Isoform 1 is not soluble in blood. Isoforms 2 (longer) and 3 (shorter, C-terminal domain missing), which are generated by alternative splicing, are both soluble and detected by this assay. The linear epitopes of the coating and the detection antibodies were analyzed by epitope mapping. The human sequence homology between Neuropilin-1 and Neuropilin-2 is low. The amino acid sequence in the respective binding regions of the antibodies shows no homology with Neuropilin-2. Therefore, cross-reactivity to Neuropilin-2 is not expected. We recommend separating plasma or serum by centrifugation as soon as possible, e.g. 20 min at 2,000 x g, preferably at 4°C (2-8°C). Samples can be stored at 4°C (2-8°C) overnight. For long term storage, aliquot the acquired plasma or serum samples and store at -25°C or lower. The stability of endogenous soluble Neuropilin-1 was tested by comparing soluble Neuropilin-1 measurements in samples that had undergone five freeze-thaw cycles (F/T). The mean recovery of sample concentration after five freeze-thaw cycles is 93%. Samples can be subjected to five freeze-thaw cycles. 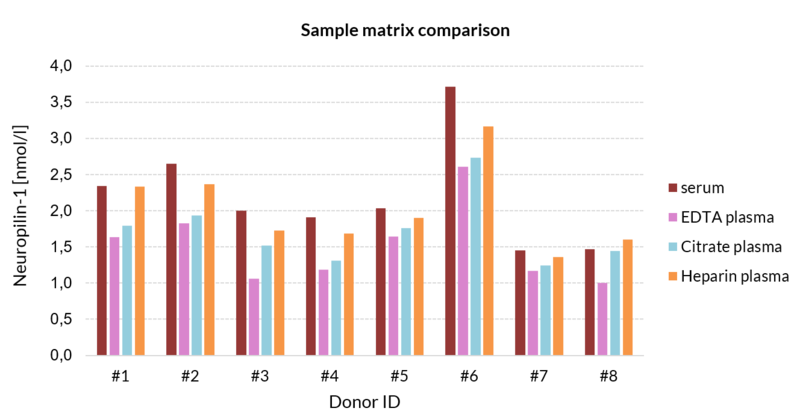 Total soluble Neuropilin-1 reference ranges were established using twenty-four serum and plasma samples from apparently healthy donors. No medical histories were available for the volunteers. We recommended establishing the normal range for each laboratory. 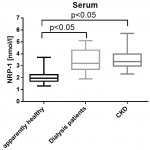 Soluble Neuropilin-1 was measured in serum and heparin plasma samples of apparently healthy donors and chronic kidney disease (CKD) and dialysis patients and patients in an unselected hospital panel. Soluble Neuropilin-1 is significantly increased in all patient cohorts. 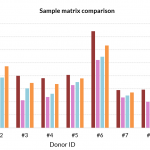 Eight samples of apparently healthy individuals were prepared, each sample derived from one donor. Samples were assayed, and the concentrations of the samples were compared. 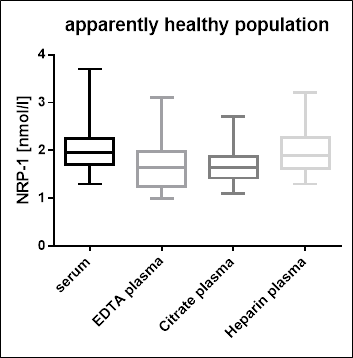 Figure showing matrix comparison of soluble Neuropilin-1 sample concentrations between serum, EDTA plasma, heparin plasma, and citrate plasma in an apparently healthy cohort (n=8).